The Institute of Environmental Science and Technology of the Universitat Autònoma de Barcelona (ICTA-UAB) analyses and quantifies the waste generated by tourists in eight islands of the Mediterranean as part of the European BLUEISLANDS project. Plastic litter and cigarrete butts are the main problems on beaches, which in summer can rise to an average amount of 250,000 items of litter daily for every square kilometre of beaches. Waste generated by tourists on beaches of Mediterranean islands increases threefold during the summer period and even reaches a seven-fold increase in some of the most touristic beaches. This is the result of the data gathered by researchers from the Institute of Environmental Science and Technology of the Universitat Autònoma de Barcelona (ICTA-UAB) as part of a European project which aims to analyse and propose solutions to the increase of summer litter on eight Mediterranean islands. The Mediterranean region is the world's main tourist destination and its islands receive a large volume of visitors during the summer months. Locel economies depend heavily on tourism as a source of income and employment generator. Nevertheless, massive yearly waves of tourists concentrated in a short period of time represent a huge burden on infrastructures, especially those related to waste management. Local authorities are studying a way to face both the high increase in waste generation and the low level of classification practiced by tourists. The European Interreg MED BLUEISLANDS project is working on the development and creation of efficient, economically viable and environmentally sustainable options with which to face and mitigate the effects of a seasonal rise in waste. Funded by the European Regional Development Funds and directed by the Cyprus Ministry for Agriculture, Rural Development and the Environment, the project studies the islands of Mallorca, Sicily, Malta, Rab, Crete, Rhodes and Mykonos, and Cyprus. The study included 147 campaigns to analyse marine litter on the islands during the high and low seasons by assessing its composition, its impact on coastlines and beaches, and its influence on wastewater treatment plant facilities. According to the results, during the high season (May to September) tourists litter the beaches with an average of 250,000 items of waste per day and square kilometre, a figure which rises up to 316,000 items per day and square kilometre in the months of July and August, and which contrasts with the 81,000 items on average per day during the low season. 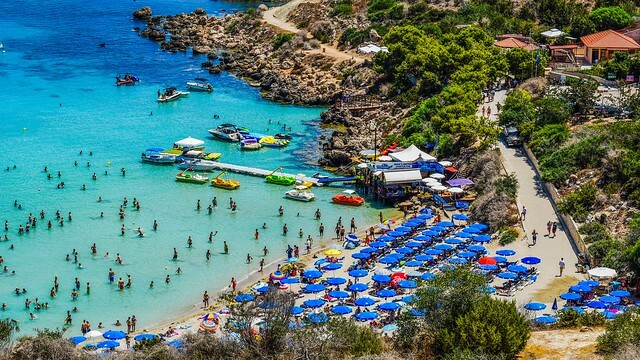 Researchers analysed separate aspects of the impact of summer months on touristic beaches (with large infrastructures created for hotels, restaurants and beach bars), the most popular beaches used by locals (with few services) and remote beaches (with no services). While in July the touristic beaches accumulated an average of 450,000 litter items daily per square kilometre, local beaches concentrated 300,000 and remote beaches 200,000 items of litter. The presence of this litter on beaches depends on the efforts authorities put into maintaining them clean and the frequency with which they are cleaned. The sand-cleaning machines usually pass daily on touristic beaches and every two days on local beaches, whereas remote beaches may not be cleaned as much due to their distance from urban centres or difficulty in accessing the area. The majority of litter found on the beaches is formed by plastics (36.8%) and cigarrete butts (30.6%). This volume of plastics was classified and quantified according to size, and researchers differentiated between microplastics (measuring less than 0.5 cm), mesoplastics (from 0.5 to 2.5 cm) and macroplastics (larger than 2.5cm). While microplastics represent 9.3% of total waste, the mesoplastics are 19.8% of the total, and macroplastics, 7.7%. All other plastic litter was formed by plastic pellets (6.2%), plastic bottle caps (3.7%), plastic cutlery (2.5%), and candy wrappers (2.2%). Other elements found included strings and cords, tissues, metal caps, glass bottles, sponges, plastic cups, cotton swabs, glass, wet wipes and tampons. "It is worth highlighting that the pellets, the small round pieces of plastic used to manufacture a variety of things, are not left on the beach by tourists, but arrive through industries. There are several production companies in the Mediterranean region and it is possible that they end up in the sea after being dumped or lost by freight carriers", explains ICTA-UAB researcher Michael Grelaud. Not all coasts of the Mediterranean are littered equally by tourists. The beaches with the greatest accumulation of marine litter can be found in Malta, where the high touristic season can produce 600,000 items daily per square kilometre (7 times above the European average), followed by Mallorca (with an average of 400,000 litter items per square kilometre in the top summer months), Rab, Croatia, with 270,000 items; and Cyprus with 113,000. In contrast, the cleanest beaches were found in Mykonos, Greece, with 8,700 litter items; Sicily, Italy, with 29,000 items; Crete with 49,000 and Rhodes, Greece, with 66,000. With regard to beaches with the greatest amount of marine litter, the first position is occupied by the Marsaslock beach in Malta, followed by the beaches of Torà in Mallorca, Golden Bay in Malta, Es Caragol in Mallorca, Gneja in Malta and Sunrise Beach in Cyprus. The cleanest beach among those analysed however was Tsoutsouras in Crete. ICREA researcher at the ICTA-UAB Dr Patrizia Ziveri recalled that although it is a well known phenomenon, the seasonal variation of waste generation on islands had not yet been correctly defined, nor its socio-economic and environmental effects determined. In addition to the human pressure suffered, "the isolation and lack of space to create adequate facilities represent an additional limitation for these islands". The BLUEISLANDS project aims to provide answers to all these concerns. Based on the results obtained, researchers will propose solution strategies to fight against the problem.